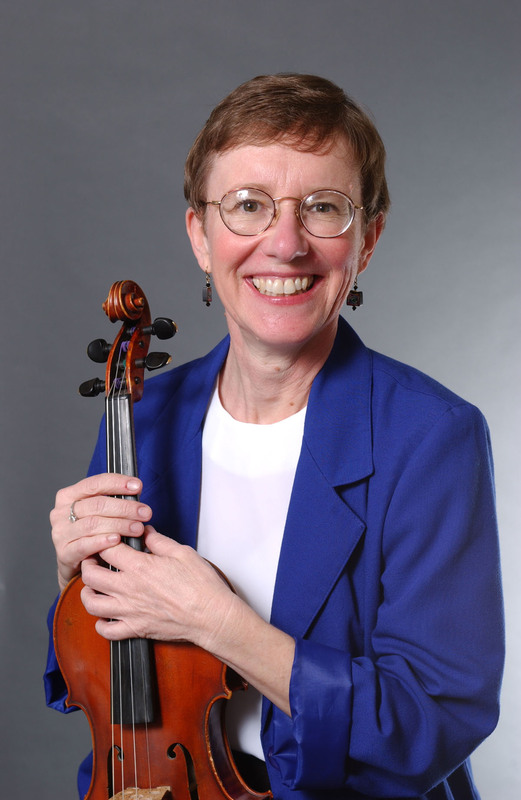 Margaret Schmidt, Professor of Music Education-strings, holds a Ph.D. in Music Education from the University of Michigan, a Master of Music in Violin performance from SUNY-Stony Brook, and Bachelor of Music Education from Lawrence University. Prior to her appointment at ASU, Dr. Schmidt was Associate Professor of Music Education and Chairperson of the Music Department at St. Cloud State University. A specialist in string education, she has held public school string positions in Naperville, Illinois, Jackson, Michigan, Albuquerque, New Mexico, and Austin, Minnesota. Dr. Schmidt’s research focuses on preservice and beginning teachers, and issues of equity and access in music education. She has published articles in leading education journals including the American String Teacher and the Journal of Research in Music Education. Dr. Schmidt is a frequent presenter at conferences including the Music Educators National Conference, the American Educational Research Association, and the American String Teachers Association (ASTA). She is founder and director of the ASU String Project, which in 2005, won the Robert Jesselson String Project Consortium Award for the nation’s most outstanding String Project. In 2015, she was selected as Outstanding String Researcher by ASTA, and as the Individual String Educator for the Governor’s Award for the Arts. Michael Smith has been performing since the age of 7 years old. He has performed for various mariachi ensembles; most notably, he performed as a member of the Grammy Award winning Mariachi Los Camperos De Nati Cano. Mr. Smith strives to bring Mariachi music to a revolutionary level. As a mariachi instructor at Rosie’s House, a non-profit organization that provides free instruments and lessons to low income families, Mr. Smith has worked towards creating a functioning mariachi curriculum. Mr. Smith also teaches part time 4th, 5th, and 6th grade string orchestra Stevenson Elementary in Mesa, Arizona. Mr. Smith earned a B.M. in violin performance from San Diego State University, and is currently studying for the M.M. in music education at Arizona State University. As a student at ASU, Mr. Smith is exploring ways to bridge the gap between conventional and non-traditional music education teaching methods. ¿A Mariachi Musician Teaching Elementary Beginning Strings? Last year, Miguel came to our university to earn both his teaching license and a master’s degree in music education. As we worked together, I learned that, at age six, he heard a youth mariachi and told his parents, “I want to do that.” They got a violin, and he joined the program. Eventually, his parents “opened a youth [mariachi] foundation which is still going. They have the non-profit, they set everything up.” Miguel and his siblings remained with that group until high school. In fifth grade, Miguel joined his school’s orchestra program. His teacher encouraged him “to play and perform and do all that fun stuff, and help the other violinists,” plus he loved being with his friends. His high school director would say, “I just don’t know what to do with you, Miguel. You’re into this music that I don’t know much about. All I can do is teach you what I know.” Not sure what college major to choose, Miguel’s director encouraged him to consider music, helping him choose audition repertoire, which Miguel learned mostly on his own. He was accepted by two universities, and chose the one nearest his family. 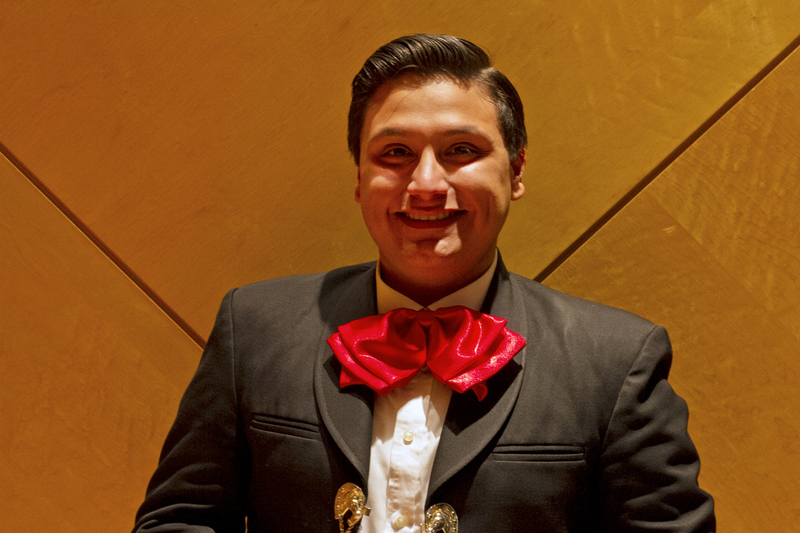 In his sophomore year of college, a prominent professional mariachi invited Miguel to join, and he eagerly accepted, intending to also continue progress towards his classical music major. The group toured frequently throughout Mexico and the US, and Miguel’s grades began to suffer. Both the mariachi leader and Miguel’s parents wanted him to prioritize his education and, after two years, he reluctantly withdrew from the ensemble. He remembers “making the hard phone call, driving up to LA to drop off the suits, the sombrero, everything, having the discussion, and you know, just—it was bad. A mess, tears, it was horrible!” In Miguel’s senior year, the university started a String Academy. Miguel knew he didn’t want a traditional performance career. He wasn’t sure he wanted to work as a teaching assistant either, but his violin teacher “pushed” him, saying, “Miguel, you have that personality. You’ll enjoy it. . . . You’ll have so many breakthroughs in your own playing. Just do it.” So Miguel and a colleague became teachers for the Academy. With a professor’s guidance, they wrote detailed critiques of prominent string pedagogies. Miguel reports that “it was exhausting,” but also valuable. He was assigned a beginning violin class for seven first and second graders at a local Catholic school. With his extensive pedagogical work, Miguel felt confident and discovered that “it worked!” Classroom management challenged his “laid back” personality, but, “By the end, I was like, ‘I know how to get these kids going, . . . to turn my energy up really fast’” when needed. What factors does Miguel consider in planning and implementing an elementary string curriculum? What beliefs about students and about music guide his developing teaching practices? How does he integrate his musical identities as teacher, mariachi, and classical musician?Data include regular observation and discussion of Miguel’s classes with accompanying videotapes, field notes, and transcripts; our written or audio-recorded reflections on his learning; and email exchanges. We intend to co-present an analysis of Miguel’s first semester of teaching with both our voices in dialogue. The aim of this study is to examine the broad musical and educational experiences Miguel brings to his first job as a music educator in a public school setting, and how these experiences shape his teaching. Researchers have examined ways that teachers incorporate music representing their students’ home cultures (e.g., Abramo & Austin, 2014; Abril, 2009; Davis, 2013; McHale, 2013; Shaw, 2015). Others have studied the experiences of preservice and inservice music educators proficient in musical traditions usually not included in university programs (e.g., Bernard, 2015; Fitzpatrick, Henninger, & Taylor, 2014; Kruse, 2013; Randles & Smith, 2012). This study may contribute complexity through examining the multiple intersections implied in Miguel’s broad musical identity, and how those intersections influence his decisions in a new job as a music educator.